Are you a business owner or foreman in charge of cleaning up after a demo or a construction site? Don’t waste time and money hauling away your own construction debris. If you add up the labor dollars you are spending on your workers cleaning up debris, then hauling it to the dump, then paying to dump it all, you’d be surprised at what all that’s currently costing you for construction waste removal in Springfield Missouri. Not to mention, that the hours they are spending cleaning up that debris could be spent on a different job site, making your business more money. When bidding a job, part of that bid goes toward renting dumpsters, or having the construction debris and junk hauled away. Save yourself some time and money by calling Dog Gone Junk to take care of that for you. No more calling a trash company to set up delivery of a dumpster, then calling them again when it’s ready to be picked up, then possibly needing them to bring out another when the first one wasn’t big enough. Then paying the overage charges when the weight is too much. Make one phone call to Dog Gone Junk and let us come and haul away all of that unnecessary debris. 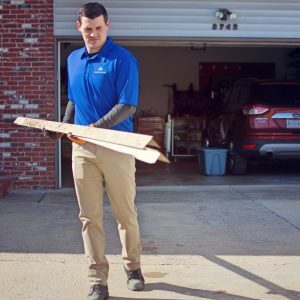 Whether it takes one trip or more, that one call to us takes care of everything. We haul everything away, clean up the mess and pay to have it dumped. All while you have already moved on to your next job and started working there. Don’t waste time and money dealing with the trash. Leave that to Dog Gone Junk. Free, no-obligation estimates and no more stress for you or your foreman. We pick it up, then clean it up, all while leaving more of your hard earned money in your pocket. Call Dog Gone Junk today for your free estimate.